Designed for the demands of aerobic athletes, the Women's Norvan Jacket provides Gore-Tex protection that is fine tuned for mountain training, running or other high output sports in wet, windy weather. Three-layer Gore-Tex fabric with C-Knit backer technology is exceptionally light, highly breathable, soft, supple, and delivers durable waterproof breathable protection. 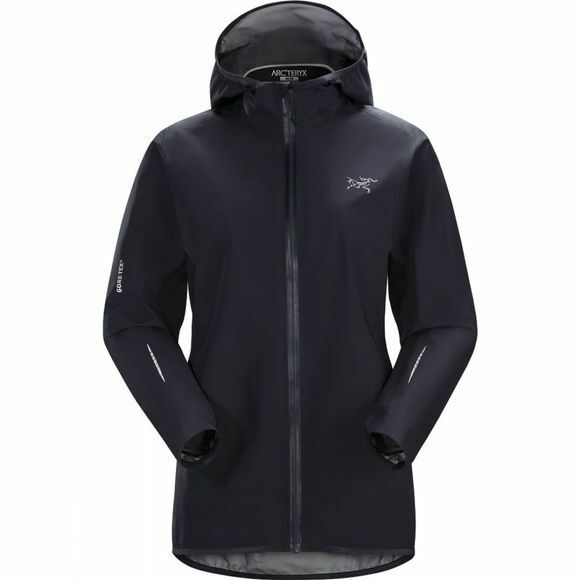 Arc'teryx Trim minimises extraneous fabric and keep the material close to the body to maximise its breathability. Articulation in the arms and gussets under the arms elevate mobility and comfort. Weighing a scant 195 grams, the Norvan's minimalism reflects a focus on performance. The fitted hood provides protection and has an elasticated brim to extend coverage and ensure a high level of visibility. Ingenious vents pull air through an opening under the arm to provide continuous airflow while in motion. The construction eliminates the need for a zip, shaving grams and removing a potential point of irritation. The water-resistant front zip has a quiet soft pull, an internal laminated zipped pocket stows and protects identification or a small digital device, and reflective blades aid visibility.